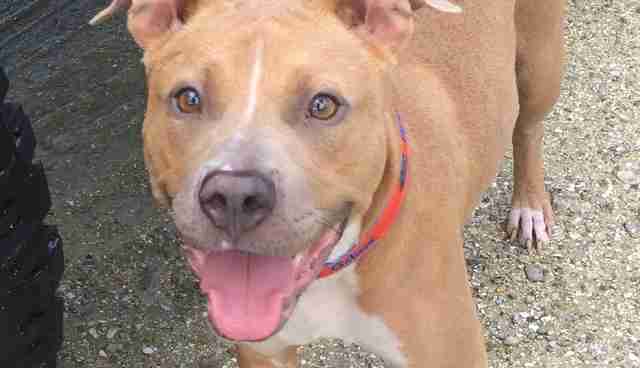 Like many rescue dogs, Bella had a tough life before being saved and adopted by a new family. But last week her story came full circle, and Bella's new parents, along with her rescuers and her foster mom, were all in the courtroom to see her former abuser brought to justice. WARNING: Graphic image below Lt. Misti Scaggs, with Palm Beach County Animal Care and Control, remembers the day Bella came into its care last June. 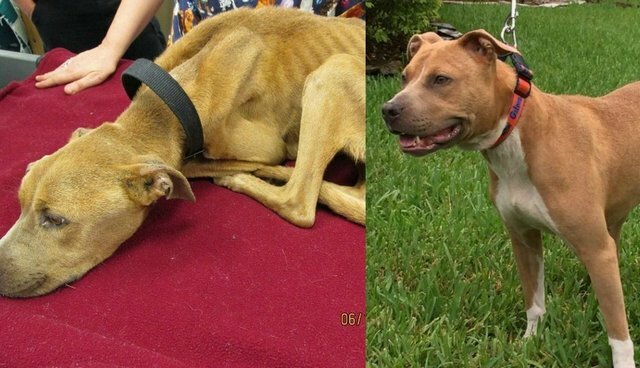 Responding to an anonymous phone call, officers showed up at Bella's home in Delray Beach, Florida, to find a horrifically emaciated dog, so thin that all her ribs showed through her skin. "On the day we brought her in, she weighed 23 pounds," Scaggs told The Dodo. "She couldn't walk; she had no energy." 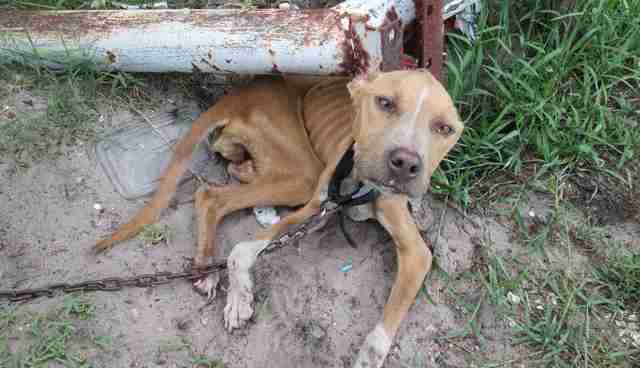 Bella's former owner, Anthony T. Herring, who surrendered her willingly, claimed she was starving because she was infested with parasites. While Bella did have hookworm, which was easily treated, she was clearly hungry and hadn't eaten in days. She gratefully accepted the wet food given to her at animal care and control. After Bella ate, her caretakers would pick her up and carry her out to the yard so she didn't waste her precious and limited energy on the walk, Scaggs said. Within days though, Bella began gaining weight and strength. Animal care and control handed her over to a rescue group as soon as she was healthy, and Bella went to a foster home to get ready for adoption. In the meantime, Scaggs and her team brought Bella's case to the state's attorney's office. Bella was recently adopted by a loving family, where she is the only dog and is showered with affection by her new humans. Apparently she loves to snuggle with her new human brother. Bella's adoptive family, along with her foster mom and her rescuers, including Scaggs, were all in the courtroom this week to see Bella's abuser's trial. According to Scaggs, the atmosphere in the courtroom was "intense." 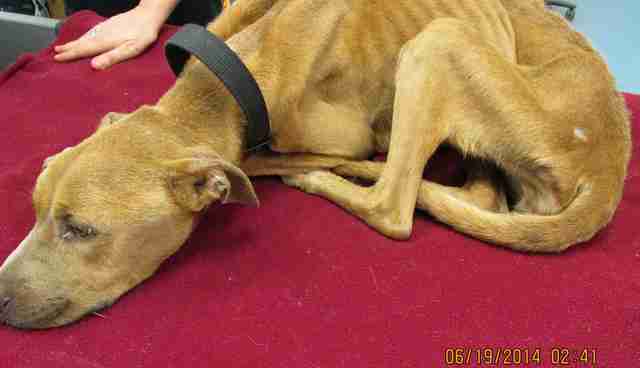 She added that there were tears as the jury listened to the details of Bella's neglect. It took the jury only 40 minutes of deliberation to find Herring guilty, the Sun Sentinel reports. He has yet to be sentenced but could receive up to two years in jail. 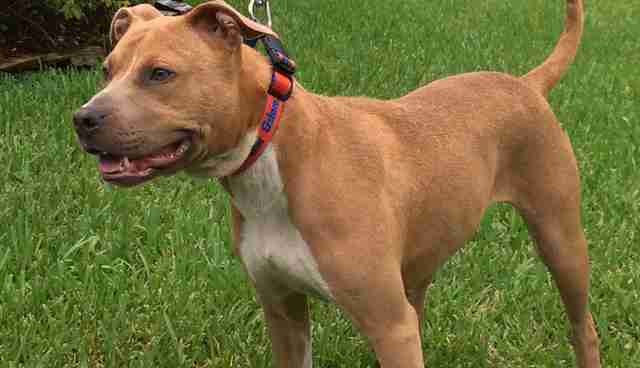 While Bella's story ends with a happy new family and a conviction for her abuser, there are thousands of dogs who aren't saved in time and whose stories are never told. Scaggs urges any and everyone who thinks they may have witnessed animal abuse to contact the authorities. After all, a simple phone call saved Bella's life.